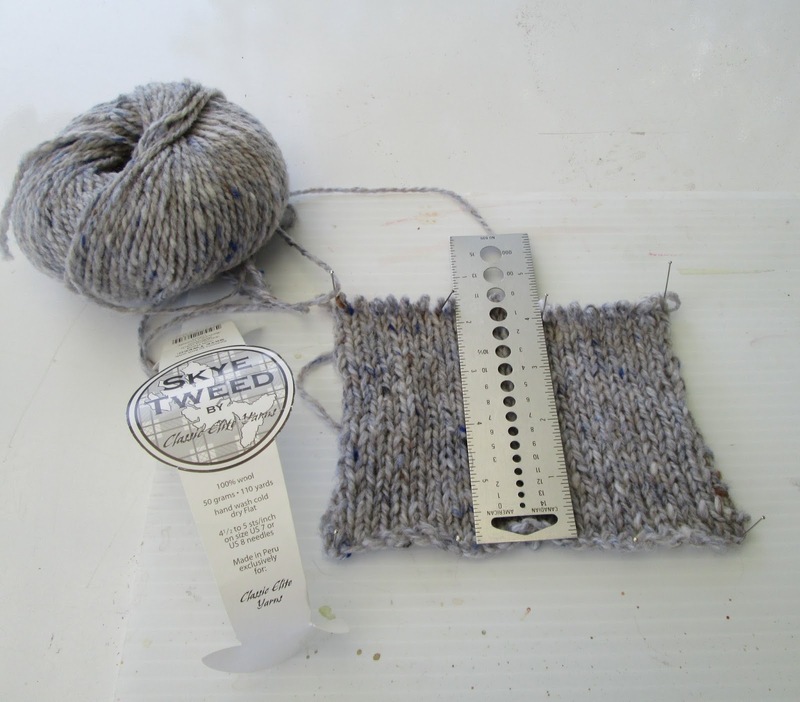 Margaret Blank: Thoughts from a Textile Artist: Look Ma -- I'm Swatching! Look Ma -- I'm Swatching! I have several projects on the go right now, including knitting. We've apparently had all the hot weather we're going to get this summer -- a few days very early in July, when we experienced 28 C - 32 C -- and the past week has been mainly cool, with roving clouds and periodic thunder showers: perfect weather for the studio -- and for yarn! As a result I finished the "Niven" shawlette in Berroco Lustra, a shop sample for The Crafty Lady in Lacombe, where (in case I forgot to mention it) I'm currently working 1 day a week (photo of my version to follow once it's on the shop model). Then I finished a ruffle scarf in Red Heart Yarn's Boutique Sashay Metallic. I may offer this one to Lori as a sample too; although it's one of 'my' colours, it's not really my style. I did it so I could say I'd done one, and as practice in case my daughter's still interested in having one. The process is simple enough but very slow for someone accustomed to 'throwing' her yarn over her right forefinger and simply breezing along a mile a minute. Yarn-play, yes. Knitting? Not so much! The Berroco Booklet that contains the pattern for "Niven", Nora Gaughan Volume 13, has a number of pieces I'd like to make. While I bought the Lustra for the shawlette at the shop (the hot pink colour-way I selected has been discontinued and was thus on special), I want to use stash yarn for the next project: the "Merle" cardigan. Mmmmmm...!! Having misjudged my size (1" larger) and gauge (only off a teeny bit but...) so that "Niven" doesn't fit me particularly well (it sits on my shoulders but the width of my back means I can't comfortably fasten it in front), I thought I'd actually do a gauge swatch for this next project, it being made with stash yarn and therefore no longer available should I run short (yes, I got it that long ago). Must be all this City & Guilds sampling stuff; I've made not one swatch, but two. First, I made one in Classic Elite's Skye Tweed. I liked it well enough to do 23 rows of the collar pattern (this booklet's patterns are all top down and like Niven, this one begins with the collar)...but the fabric created by those rows felt a bit stiff and heavy, so I decided to try my next stash selection: Jo Sharp's Silkroad DK Tweed. 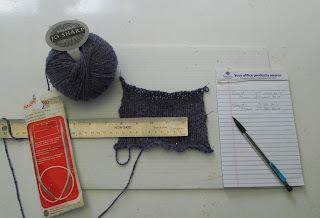 Required: 18 stitches and 25 rows to 4" in stockinette with the larger of the two sets of needles (5.5 mm). Skye Tweed: 17 stitches and 23 rows to 4". DK Tweed: 18 stitches and 24 rows to 4". I've now cast on for the collar (again) on a second set of 5.5 mm needles and will compare the two fabrics when I get the first 23 rows done. By WIP Wednesday, I'll have a fresh report on from the quilting studio. See you then!